On this page, you will find the past issues of our regular newsletter, Partnerships Panorama, which features news, resources for those interested in International Health Partnerships, and updates from ESTHER Ireland, and European ESTHER Alliance partners. If you have any news that you would like to be included in Partnerships Panorama, please email info@esther.ie. If you do not currently receive Partnerships Panorama, please subscribe using the form at the bottom of the page. October Issue, 2018: New ESTHER Health Partnerships, 4th Annual ESTHER Ireland Partnership Forum, THET Conference Highlights and more. August-September Issue, 2018: ESTHER Welcomes the Gorey-Malawi Health Partnership, Executive Course in Health Diplomacy & Humanitarian Space, AIDS2018 Follow-Up Event, Submission Opportunity for Upcoming GHE Conference and more. June-July Issue, 2018: ESTHER Alliance 2018 Meeting, UN High-Level Meeting on Ending TB, Fifth Global Symposium on Health Systems Research and more. May Issue, 2018: HSE & Sudan Ministry of Health Partnership, GDPR Request by ESTHER Ireland. March Issue, 2018: Awarding of Eight New ESTHER Small Grants, Upcoming WHO Dialogue on Financing for Prevention and Control of NCDs, Future Health Summit 2018 and more. Special Announcement, August 2017: Training opportunity: International health & development training for healthcare workers. July Issue, 2017: Small Grants Interview Series Dr. Niall Conroy (UCD CEMS + Bo Government Hospital, Sierra Leone); Snapshot: Insights from the Small Grants Programme; News items; Education & training opportunities; Publications; Call for health partnerships resources and news. Special Announcement, May 2017: The 4th Global Forum on Human Resources for Health. April Issue, 2017: New ESTHER Ireland Partnership: HSE + Ministry of Health, Mozambique; Small Grants Interview Series: Dr. Cliona O’Sullivan (UCD Physiotherapy); News items; Education & training opportunities; Publications; Call for health partnerships resources and news. November Issue, 2016: Partnerships Forum; New Publication: ESTHER Ireland Health Partnerships: What Have We Learned? ; Small Grant Focus: Palms GP Surgery – Mzuzu Central Hospital Partnership; News items; Education & Training Opportunities; Publications; Call for Health Partnerships Resources and News. September Issue, 2016: Partnerships Forum Save the Date; Small Grants Interviews Preview; News Items; Education & Training Opportunities; Publications; Call for Health Partnerships Resources and News. June Issue, 2016: ESTHER Ireland Start-Up Grants workshop; European ESTHER Alliance Meeting in Oslo; News Items; Education & Training Opportunities; Publications; Call for Health Partnerships Resources and News. April Issue, 2016: ESTHER Ireland Start-Up Grants; News Items; Education & Training Opportunities; Publications; Call for Health Partnerships Resources and News. February Issue, 2016: New ESTHER Ireland Start-Up Grant Awards; News Items; Education & Training Opportunities; Publications; Call for Health Partnerships Resources and News. December Issue, 2015: Partnership Feature: Developing a Regular Paediatric Oncology Service in Dar es Salaam; News Items; Upcoming Funding and Training Opportunities; A Look Back at 2015 With the Irish Forum for Global Health. November Issue, 2015: A new full ESTHER Ireland Partnership is announced! European ESTHER Alliance Meeting in Dublin; Upcoming Start-Up Grants Deadline; News Items; Publications and Articles; Upcoming Conferences & Events; Call for health partnerships resources and news. October Issue, 2015: New Start-Up Grants awarded; News items; Upcoming conferences; Knowledge resources: Sustainable Development Goals; Call for health partnerships resources and news. July-August Issue, 2015: Overseas volunteering in infection prevention & control; Start-Up Grants; Curing children’s cancer in Tanzania 2015-2020; News items; Call for health partnerships resources and news. May-June Issue, 2015: ESTHER Ireland Start-Up Grants; Visit to Ireland by staff of Lalgadh Leprosy Services Centre, Nepal; RCSI-COSECSA Partnership Update; News Items; Call for health partnerships resources and news. April-May Issue, 2015: ESTHER Ireland news; News items; Lessons learned from the Ebola response; Call for health partnerships resources and news. March-April Issue, 2015: News Items; Spotlight: ESTHER Ireland Start-Up Grants Workshop (Dublin); Update: Department of Public Health, HSE MidWest + Lalgadh Leprosy Services Centre, Nepal; Call for health partnerships resources and news. January-February Issue, 2015: News; Spotlight: The EQUALS Initiative; ESTHER Ireland Start-Up Grants Programme; Diverse Partnerships. November-December Issue, 2014: ESTHER Ireland partnerships news; Steps to working in partnership; ESTHER news and updates; Call for health partnerships resources and news. July Issue, 2014: The new European ESTHER Alliance Strategic Framework for 2015-2020; The ESTHER Roadmap; ESTHER Ireland elected chair of the Interim Board of the EEA; Upcoming European ESTHER Alliance meeting in Morocco; Ireland’s ongoing commitment to overseas health systems strengthening; Resources and events on partnerships for health. 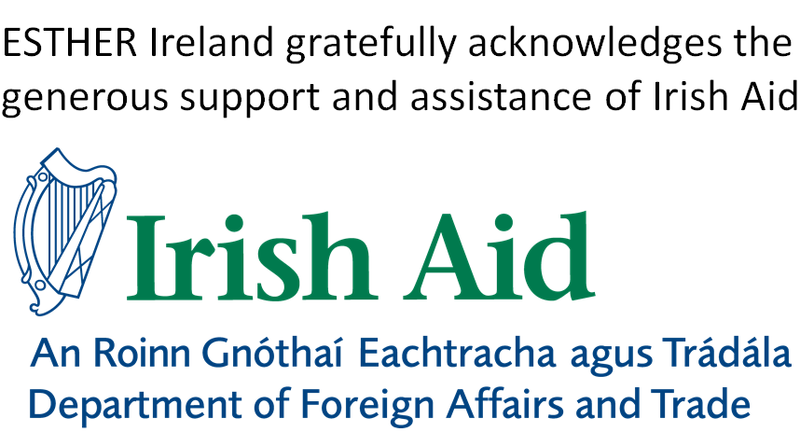 June Issue, 2014: Working at home and abroad; Overseas volunteering for Irish health professionals; Domestic news; Resources for partnerships for health. May Issue, 2014: IFGH International Conference registration; THET International Conference reminder; VSO seek volunteers; Partnerships web resources. April Issue, 2014: Overview of WHO African Partnerships for Patient Safety (WHO-APPS). March Issue, 2014: ESTHER Ireland Website update; ESTHER Ireland Start-Up Grants; Web Resources.